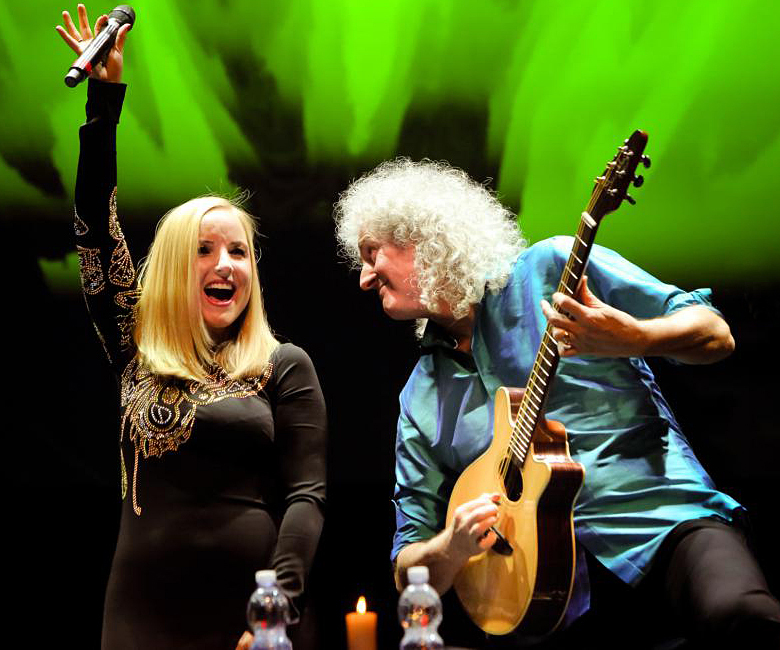 Brian May performing live with Kerry Ellis on the intimate "One Voice" European tour at Teatro Le Muse, Ancona, Italy on 21st February 2016. The Acoustic Centre and House Music have had a long association with Brian May... the Brit guitar legend has been a loyal customer and friend of the Acoustic Centre for many years, even going so far as to cut the ribbon for the grand opening of their London City branch. The store - along with the Bass Centre - was also a major supplier of kit for the West End and touring productions of the smash hit Queen musical "We Will Rock You". 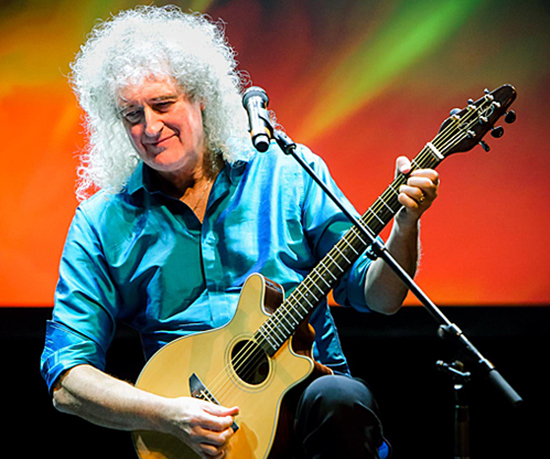 More prominently, Brian and his long serving guitar tech, Pete Malandrone have been active in an ongoing collaboration with House Music under the BRIAN MAY GUITARS moniker, a hugely successful vehicle for a range of cost-conscious, production replicas inspired by Brian's "Red Special", the iconic instrument he constructed with his father more than 50 years ago that has since become as celebrated as the great man himself. In addition Brian May has also contributed to the development of a range of other instruments including The BMG Bass, BMG Uke and The BMG RHAPSODY. A superb, next generation, small-bodied, electro-acoustic guitar The BMG Rhapsody sports a distinctive "Red Special" flavoured double cutaway design and serious quality on-board Fishman electrics. With its compact dimensions, road-ready construction and a crisp, versatile sound, the Rhapsody makes an ideal travel companion, songwriting partner and first-call studio instrument with a delivery and performance fit for any professional stage. Delivering superb quality natural sound, the Rhapsody comes equipped with a Fishman Sonicore braided, under-saddle pickup and the fully-featured Presys+ onboard active preamp. Brian May Guitars has only two instruments available in its catalogue. Two? If there’s one artist on the planet that is famous for using only one guitar it has to be Brian May... so what’s the other one? Throughout his career, May has rarely been seen with anything apart from his home-built Red Special electric guitar. This iconic instrument has spawned many replicas – commercial and non-commercial – from companies like Guild and Burns in addition to several independent luthiers. However, build quality issues, problems of supply and ultimately cost killed off the commercial models, leaving the way clear for May, his tech Peter Malandrone and House Music to take control of the brand. The result of the collaboration is the super-affordable and acclaimed Brian May Special. The other guitar is the Rhapsody, a small bodied electro-acoustic based on the shape of the Special. The Rhapsody is fitted with a B-band 22R Under Saddle Transducer and an A5T pre-amp, which also features a chromatic tuner with LED readout, a notch filter to reduce feedback and a frequency rotary control in addition to four-band EQ, a Phase button, battery check and overall volume control. Although the specs on the Rhapsody are sparse, it appears the guitar is constructed with a Spruce top with Mahogany back and sides and a Mahogany neck. The neck is reasonably chunky and the 24-fret Rosewood fingerboard seems slightly wider than a regular acoustic guitar. Also, the Rhapsody features a zero-fret, as does the Special. Other features include a good quality set of machine heads with black buttons and a compensated bridge saddle for improved intonation. Brian May’s signature is neatly inlaid on the headstock. First impressions of the Brian May Rhapsody are that it’s small, light and comfortable to hold. Unfortunately, there’s no strap button fitted so I was unable to determine the balance when standing. However, it’s an extremely easy guitar to play even with the slight extra girth of the neck and fingerboard. Intonation on the review sample was spot on, although as with many acoustic guitars, you may find you have to tune the bottom string slightly flat to make full chords in tune. Acoustically, the Rhapsody isn’t the world’s loudest instrument, but it does have good balance and responds well to some hard picking reasonably bold strumming. Plugged in, the B-band system takes over and transforms the Rhapsody into a completely different instrument which wouldn’t be out of place on a professional stage. There are a lot of tonal options on the A5T; the four-band EQ offering plenty of variation to suit all tastes. Scooping the mids and slightly boosting the bass and treble yields the classic electro-acoustic sound but it’s certainly not the only available option here. In conclusion, the Brian May Rhapsody is a bit of a surprise. It plays like a professional instrument and has all the on-board electronics in the B-Band system to complement the fact. Fit a strap lock and you’re away. The guitar is available in Antique Cherry and Natural finishes and comes complete with a custom form fitting hard case.